Pecan Crusted Fried Okra fries up crispy and crunchy with a wonderful nutty flavor. 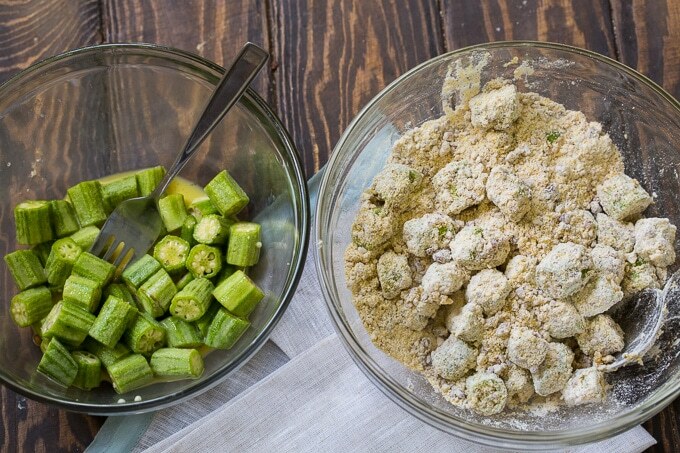 The sliced okra is coated in ground pecans mixed with flour and cornmeal plus a little cayenne pepper. It fries up fantastically golden in just a few minutes. 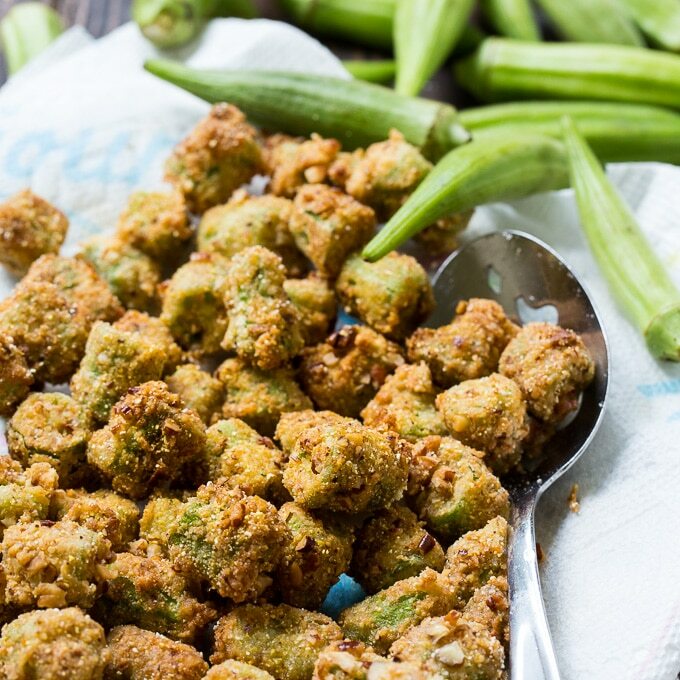 I grew up eating fried okra and I absolutely love it. I never pass up a chance to eat it. Every now and then I make my own at home. 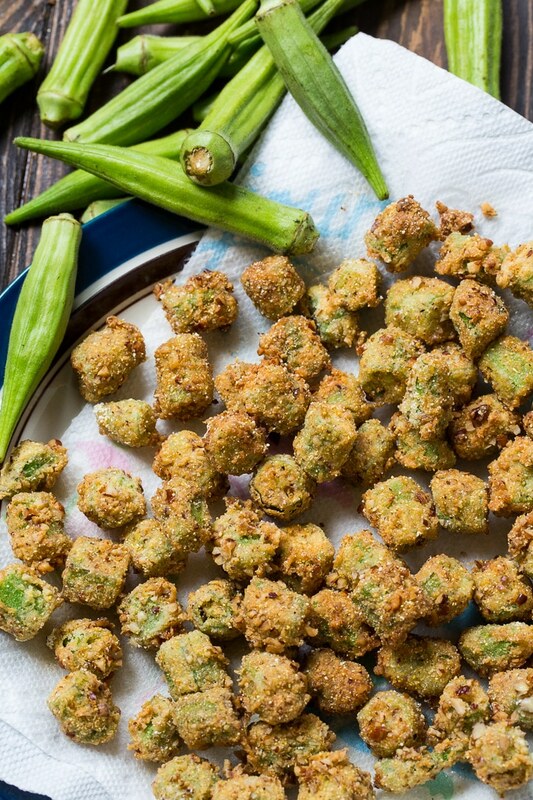 This Southern Fried Okra is my favorite. The last time I made fried okra, I wanted to try something a little different. I had seen a recipe in a cookbook for pecan fried okra and I thought it sounded interesting. Turns out it is really good. When buying okra for frying, pick out shorter pods. They tend to be more tender and the longer pods can be too fibrous. I think this Pecan Crusted Fried Okra tastes fantastic on it’s own but it would also be good with a Buttermilk Ranch Dip. I like to fry Pecan Crusted Fried Okra in peanut oil, but Vegetable or Canola oil work well too and are more economical. 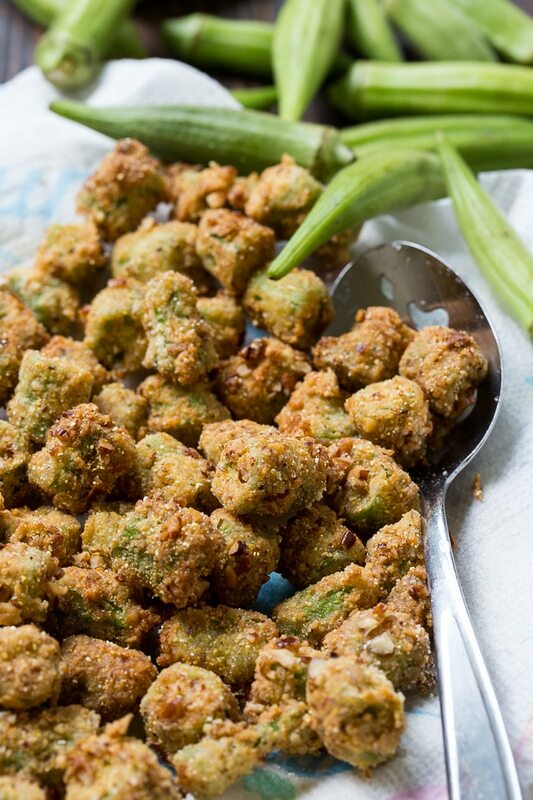 Fried Okra is a southern classic and this Pecan Crusted Fried Okra is great for when you want something a little out of the ordinary. Process pecans in a food processor until finely ground. Combine pecans with flour, cornmeal, salt, and cayenne pepper in a medium bowl. In a separate medium bowl, whisk together egg and milk. Pour about 2 inches of peanut oil in a heavy-bottomed skillet. Cast iron is perfect but any quality skillet will do. Place okra in bowl with egg mixture and stir to coat okra well. Toss about 8 pieces of okra at a time in the flour mixture. Fry okra in batches until golden brown, about 4 minutes. Drain on a paper towel-lined plate. Season with a little more salt. This entry was posted in Appetizers and tagged okra. Bookmark the permalink.